As spectacular as a Victoria Falls safari is during the day, it is even better at night. 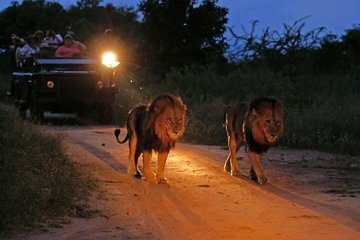 Join an evening safari in an open-sided 4x4 for opportunities to see nocturnal animals in their natural environment, including the chance to see large predators like lions and hyenas on the hunt. Then, enjoy a 3-course barbecue dinner and drinks around a campfire before returning to your hotel. This tour was a problem from the start!! I have booked several tours with Viator and every tour company confirms--except for this one! I called the day of the tour, to the company on the voucher. They insisted that they meet me to get the voucher and the money--before the tour that evening. A man came to our hotel, to get the 20 in cash for the park fee. He also said he needed the voucher at that time and I gave it to him. He said that they would be at our hotel at 3:30pm. We were waiting for them and another man, in a jeep was looking for three people for the 3:30 tour. I asked him the name of the guest and he did not have the name. The van had a completely different name than the tour company on the voucher. He was insistent that he was NOT picking us up. I began to call to find out what was going on. Then, the man decided he would take us and that there was some sort of error with the tour company and honestly, I could not understand his excuse. But, we then left for our bush drive. We finally entered a park gate and began driving around in a jeep through a bunch of brush. by this point in our African trip, we had been on four drives and had been in Africa for 14 days--we knew what a game drive should look like. The driver informed us that this was a private park that protected rhinos--13 of them. So for 1.5 hours, he searched, for that ONE rhino!! We had to get out of the jeep, and walk down a path, to see a rhino off in the distance and the other side of the water hole. Mind you, the advertisement says that they would provide insect repellent--they did not! I didn't bother to put ours on as I thought we were getting to use theirs for the evening. We drove to someone's house, where there were two zebras in the front yard. We stopped for our refreshments--some wine, spirits and a few snacks. The driver set up a table and we stood by the table and the jeep. The sunset view was however, very nice. But, at this time, I was getting bit by mosquitos and just wanted to leave. We left for the nighttime portion of the drive. One more hour of looking at bush with a flashlight. At dinner time, another guest was leaving early, and we chose to do the same. We left without eating and quickly went back to our lodge where we could actually see animals from the deck of the lodge at the watering hole. Also, there is NO transfer between countries as said in the first review. As I should remember, buyer beware--there was only one review prior to our booking. This was a great tour- just as described and the tour operator was amazingly gracious- Tamuka Travel- His name is Brighton Marwofa- and not only did he assure a smooth transfer and trip- but he stayed with us duering the border crossings and helped us navigate the VIctoria falls dilemma- can be seen from both countries but confusing-without asking for anything. He was amazing. So glad we booked this tour - It was the best one we had in Vic Falls.